Finished in silver metallic with 1/2 blue perforated leather interior trim stitched in white, satellite navigation, front and rear parking sensors, 19" multispoke alloy wheels, electric heated front seats, xenon headlights, mahogany veneer trim, electric folding mirrors, leather steering wheel with paddleshift, digital climate control with air conditioning, drive select, grey brake callipers, CD player, front centre armrest, heated front screen, floormats, automatic transmission plus more standard specification. 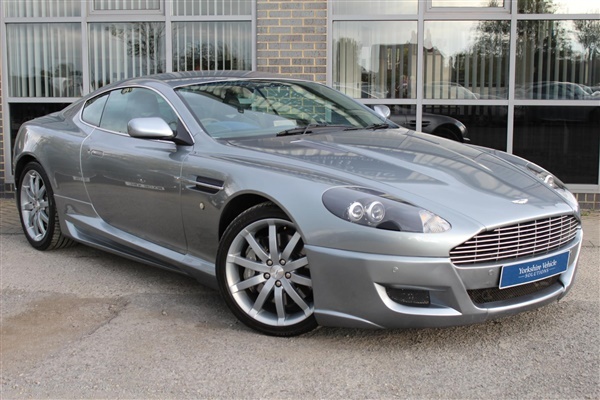 This stunning Aston Martin DB9 has only covered 56000 miles from new and is offered in excellent condition. Car comes complete with an Aston Martin main dealer service history benefitting from a service just 150 miles ago. GOOGLE YORKSHIRE VEHICLE SOLUTIONS FOR OUR CUSTOMER REVIEWS. PLEASE CALL OR E-MAIL FOR FURTHER DETAILS OR TO ARRANGE A VIEWING. OPEN 7 DAYS A WEEK SO CALL IN AND SEE US TODAY, ALL CARS HPI CLEAR, PX WELCOME & WARRANTY INCLUDED. PLEASE CALL US FOR A FINANCE QUOTE. This advert is for an Aston Martin DB9, click Aston Martin DB9 in York to see more cars like this in the local area. Want to search further afield? Click Aston Martin DB9 in North Yorkshire to search for similar cars in the wider North Yorkshire area.